Drums Alive curriculum and training programs combine fitness, drumming, music, and educational concepts. This program is designed to improve the physical, emotional, and social health of participants. 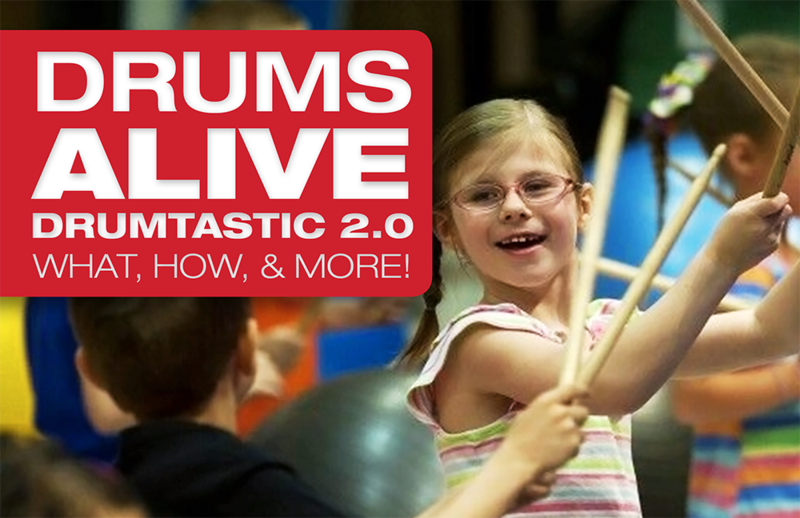 Drums Alive transforms your school programs into inviting places to thrive and get active! These areas include music, PE, general education, before-and after-school, recreational, and wellness benefit from Drums Alive. The possibilities are endless. West Music is Your Drums Alive Source! West Music is the exclusive distributor of Drums Alive instruments, accessories, CDs, and DVDs. We are also an authorized reseller of Drums Alive curricula. We offer multiple instrument packages and accessories, to bring these exciting, high-energy programs to life for your participants. Read on to find out how to get started with the Drums Alive Drumtastic 2.0 collections. Also, find out how to set up your room, get ball inflation tips, and discover your storage options. Finally, we discuss the curriculum, resources, apparel, and rebate incentive. How to Get Started with Drums Alive! We created the Drumtastic 2.0 collections for individuals and groups. Each participant needs their own “drum set” for the Drumtastic experience! A “drum set” refers to one stability ball and one Drums Alive bucket base. Next, each instructor should have a setup of three “drum sets” in total. This accommodates “mirroring” and leading from the front of a group. There are several options available, including the Trainer Kit, the Participant Kit. If you have a classroom to outfit, we designed larger collections for 20, 25, and 30 participants. Within these collections and kits are scarves, drumsticks, stability balls, egg shakers, boomwhackers, and bases. On the other hand, if you are looking to purchase a “drumset,” we have two options available. These are the 55cm drum set and 65cm drum set. Fear not, there is curriculum materials available to get you moving and drumming with three curriculum options. Included in each curriculum kit is an online subscription and Kids Beats Volume 1 CD. We invite you to find the one that fits your needs! Curriculum Kit A comes with the online subscription and Kids Beat Vol. 1 CD. Curriculum Kit B comes with the online subscription; Kids Beat Vol. 1 CD and Teacher’s Manual. Finally, the best seller is Curriculum Kit C because it includes the online subscription, Kids Beat Vol. 1 CD, Teacher’s Manual, and the Teacher Resource Box with over 300 Activity Skill Cards. When you submit your order for the online kit you’ll be asked to provide the name, email address, and phone number for the person designated as the subscriber. For best results, make sure the latex-free Stability Ball is fully inflated when in use. The 65 cm stability balls may be inflated up to 81 inches in circumference. Stability Balls measuring 55cm may be inflated up to 69 inches. For younger (grades K-2) or seated players, we recommend the 55cm Stability Ball. Then for 3rd grade students through adult populations, we recommend the 65cm Stability Ball. When inflating the stability balls for the first time, fully inflate the ball and let the materials sit overnight (or for a few days) before using. This action will allow the material to stretch. Then, you may add a little more air into the stability ball to reach the desired circumference. Each stability ball comes with one plug puller and one ball plug. Extra plugs are available at westmusic.com. The Airhead Inflator Pump packs a big punch in a small package! Because it comes with several different nozzles, you can also use it with other products. The best part is that the inflator pump also deflates the stability balls quickly! We recommend wearing earplugs when using because of the noise this pump produces. The Airhead Inflator Pump is sold separately. Some assembly is required to connect the scarves to the drumsticks. We recommend using hair bands because they’re more durable and more accessible to remove. Watch this video for tips on attaching your scarf to a drum stick. Many teachers are in mobile classrooms, so here is a system help you store and move your Drumtastic 2.0 collections. The West Music Rolling Storage Tote holds 33 deflated stability balls to quickly roll into your classroom. Additionally, Drums Alive bucket bases stack on top of the tote to optimize your space. Check out our awesome Drums Alive t-shirts and tank tops here! The best seller among music educators is Kids Beats-Vol 4 and More. Vol 4 contains 20 songs and instructional videos focusing on the warm-up, drumming, cross-cultural connections, wellness, and cool down. Carrie Ekins is Chief Executive Officer, Education Director and owner of Drums Alive. She also is the founder and creator of Drums Alive® and co-founder of Academic Beats®. Carrie has a master’s degree in Physical Education, Dance with emphasis in Sports Medicine from Brigham Young University and is a doctorate candidate at the University of Chemnitz, Germany. She is an international presenter, trainer and educator in the fitness and wellness field and has been awarded 2012 Program Director of the Year from the IDEA (International Dance Exercise Association) and Best International Presenter 2010 and Most Innovative and Creative Programming for Drums Alive® 2010 from the ECA (East Coast Alliance). Carrie is known for her creative and unique approach to total fitness through incorporating the mind, body, and spirit into an integrated educational, fitness/wellness, and therapeutic program for all populations. If you purchase any Drums Alive 20, 25, or 30 Participant Kit and complete at Drums Alive training, you receive a $50 West Music Gift Card. You must complete the training within one year of kit purchase. To redeem your West Music Gift Card, send a copy of your Drums Alive training certificate and a copy of your West Music invoice documenting the purchase of your Drums Alive 20, 25, or 30 Participant Kit. 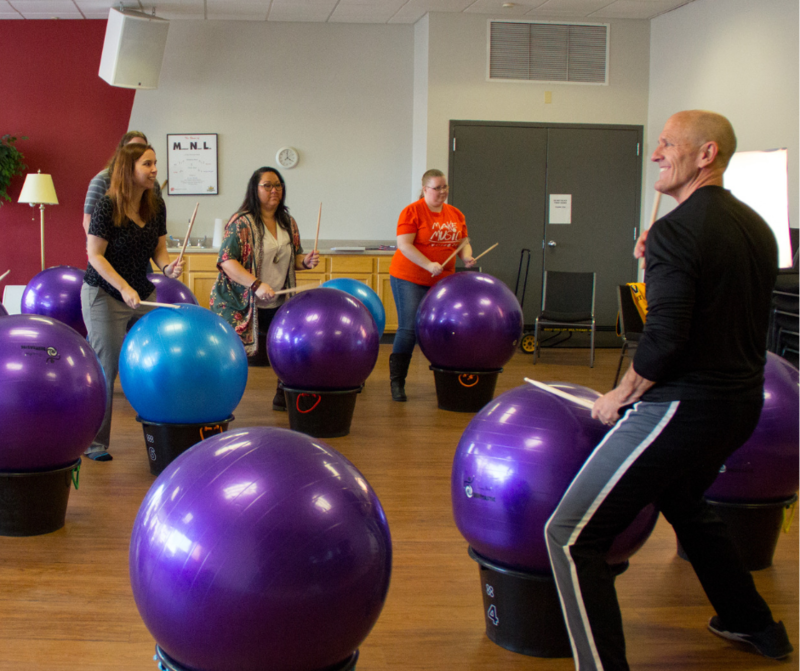 Drums Alive offers exceptionally engaging and varied programs that focus on building active movers and learners. Check out our Drums Alive page for additional details. Please feel free to contact us directly about any Drums Alive related questions at service@westmusic.com. Tereasa Evans is the Music Education Consultant for Classroom Percussion and Wellness. She has her Bachelor’s degree in Music Education and her Master’s of Music in Percussion Performance, has her Level I, II, and III Orff-Schulwerk certification, has taught elementary music in the state of Florida for 10 years, along with participating in and directing various indoor, marching/DCI, and percussion ensembles throughout Indiana, Kentucky, Ohio, Tennessee, and Florida. She has performed on many platforms including symphony orchestras, world music ensembles, drum corps, and drum circles. Tereasa is also certified in Remo HealthRhythms facilitation, Beat the Odds, and currently pursuing her Drums Alive Master Trainer status. 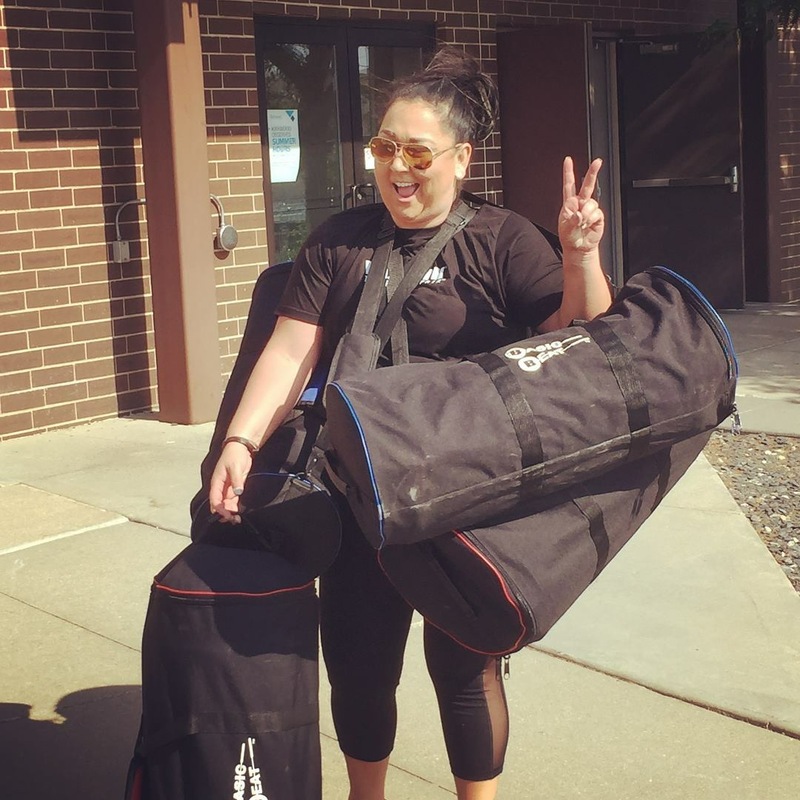 She manages products for music therapists, music educators and the general hobbyists specifically related to unpitched percussion in an elementary music classroom. She works with West Music’s own music therapy department to produce and provide instruments to meet the needs of music therapists not only for the in-house department but customers around the country. She also works with major percussion manufacturers to meet the needs of her customers. Whether she’s striking, shaking, scraping, drumming, or breaking instruments it’s all for a good reason and to benefit her customers.